Colors are not only aesthetically beautiful. They also play a role in how we feel. When decorating a home, the addition of specific colors brightens up a space, making it feel larger than it is. Lighter shades of blues aired with teal and gold creates a feeling of luxury without being over-the-top. By keeping the color palette minimal throughout the room and adding a smattering of color in central locations, your eyes travel throughout the space taking everything in thoughtfully. 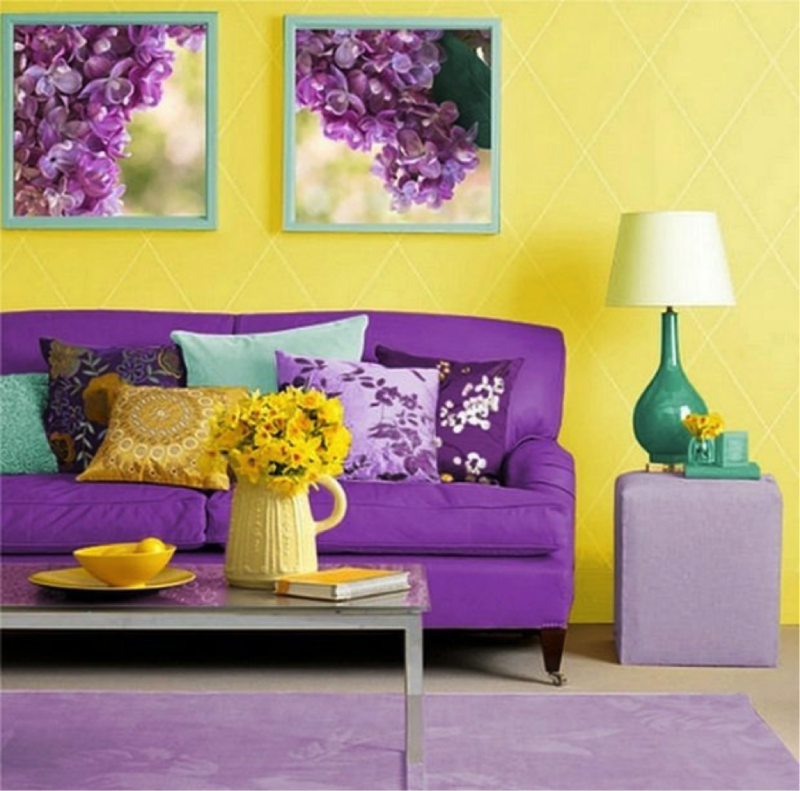 Buttercup is warm and buttery making it the perfect backdrop and accent color for this lavender colored living room. 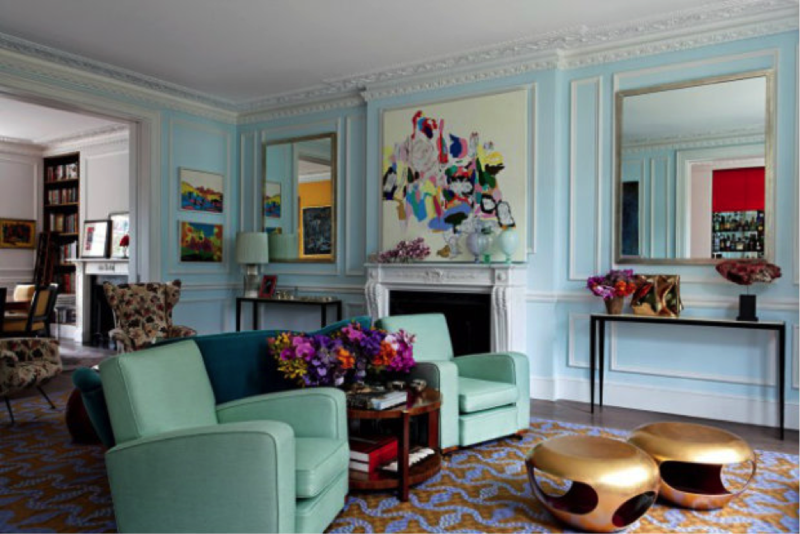 The two colors complement one another and allow room for another color, a light teal blue, to come into play. Earthy greens bring energy into a space. 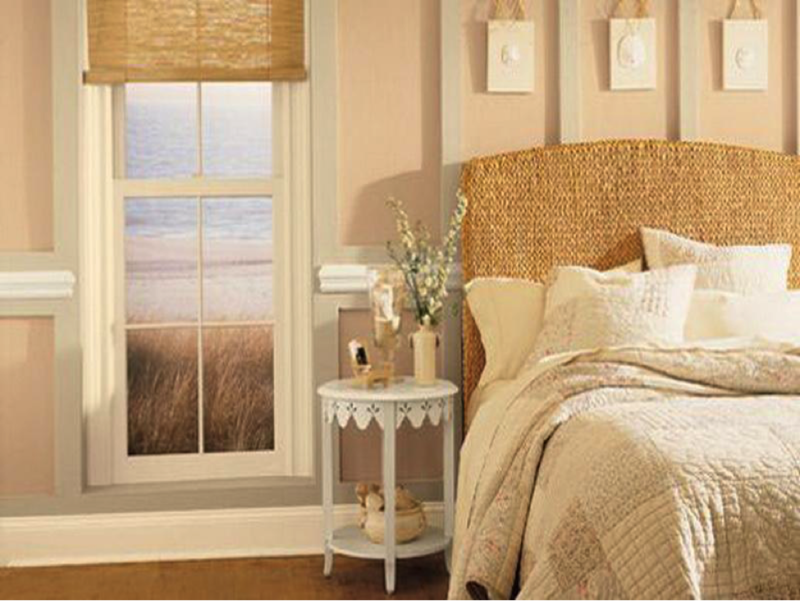 They give a room a natural, organic feel and match other bright colors such as pinks and warmer shades of blue well. 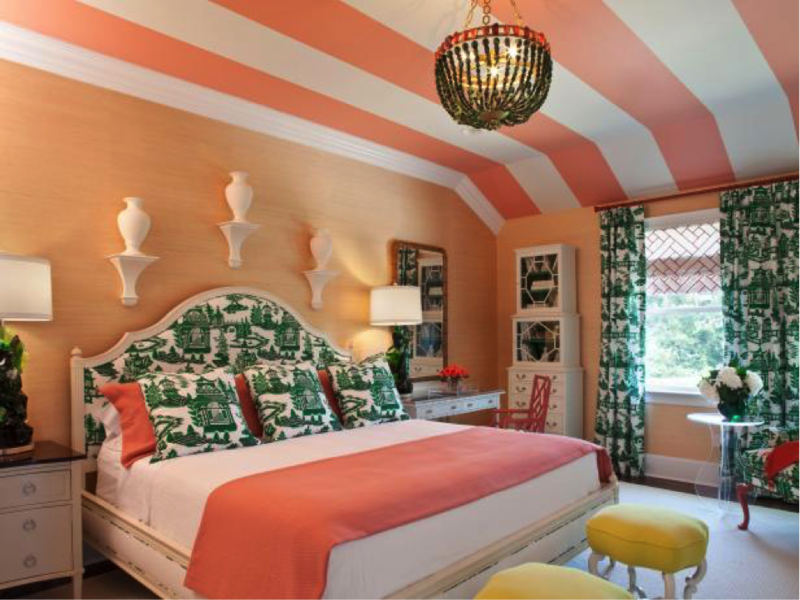 A beautiful coral color goes well with green as demonstrated by the décor in this bedroom. A bold print paired with solids makes an interesting display that everyone loves. 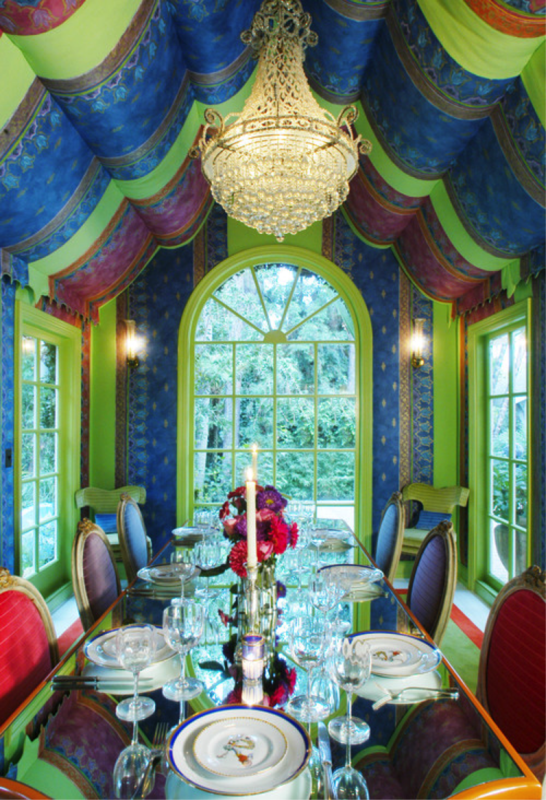 A combination of bright jewel tone colors makes a space sing. See how the pinks, blues, reds, yellows, oranges, and greens come together in a cohesive way? 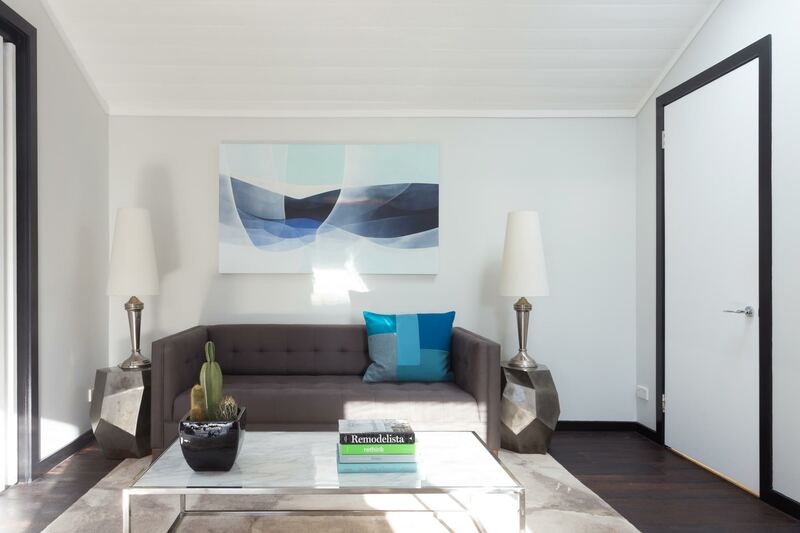 Pairing cool blues with warm blues helps create depth in this beautiful living space. The rug helps pull the darker blues in, giving them the opportunity to shine. 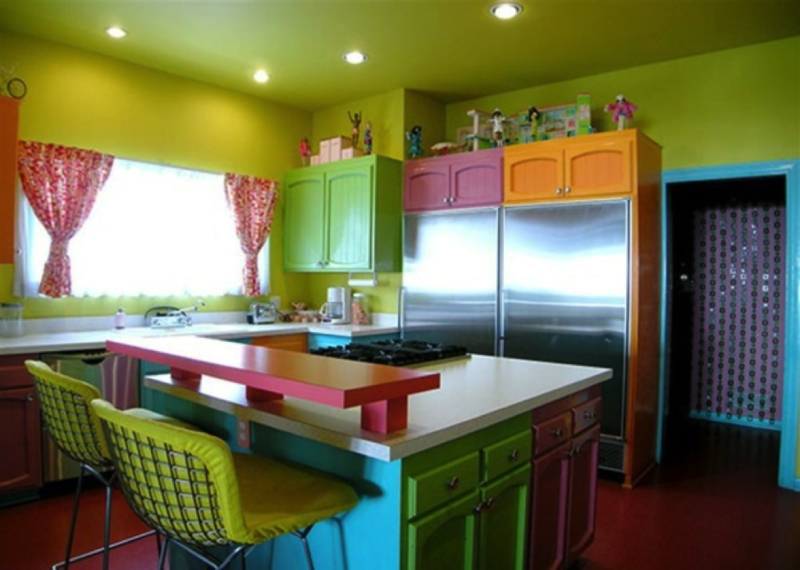 A bold use of color transforms a home. It makes it bright and interesting. It also evokes feelings of tranquility and creativity which is ideal if you’re looking to invite more of both into your life. 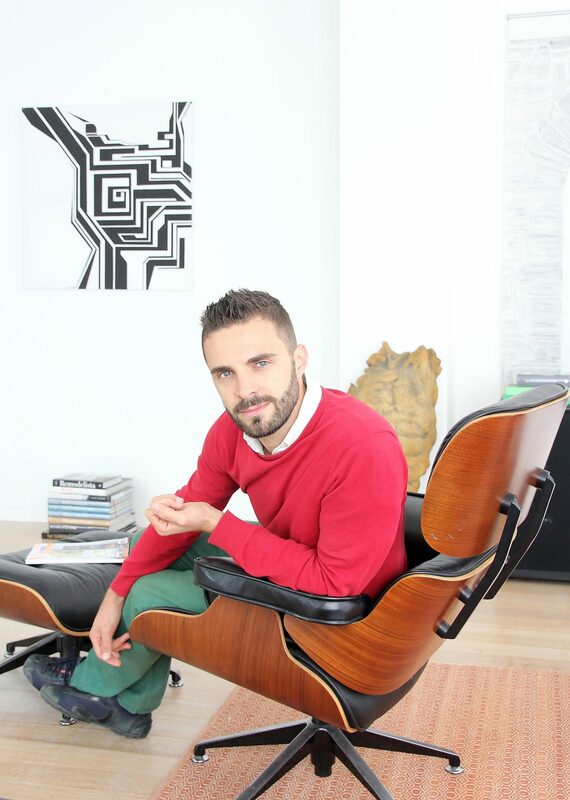 Tomasso Spinzi is a top Melbourne based Interior Designer who hails from Lake Como, Italy. His eclectic style and design sensibility of marrying old with new is something that the team at Jason Agustina have a strong admiration and great appreciation for. 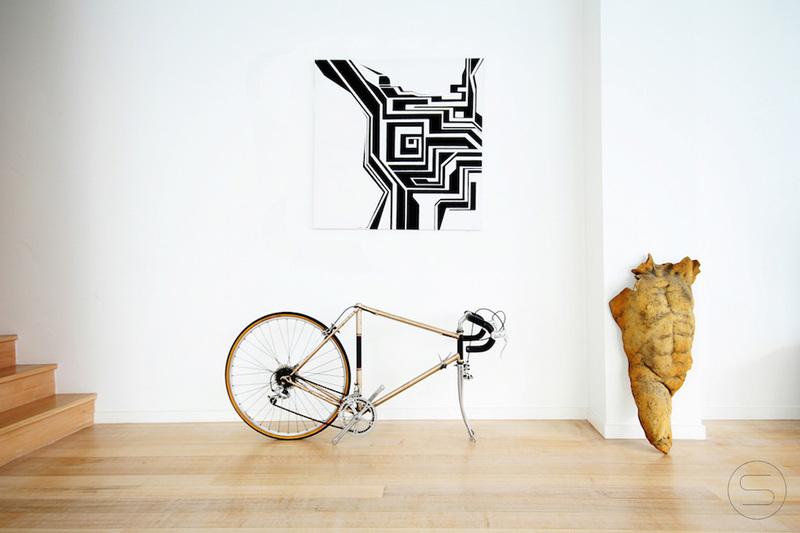 We first came across examples of Tommaso’s work whilst perusing the inspirational design resource site Houzz.com. 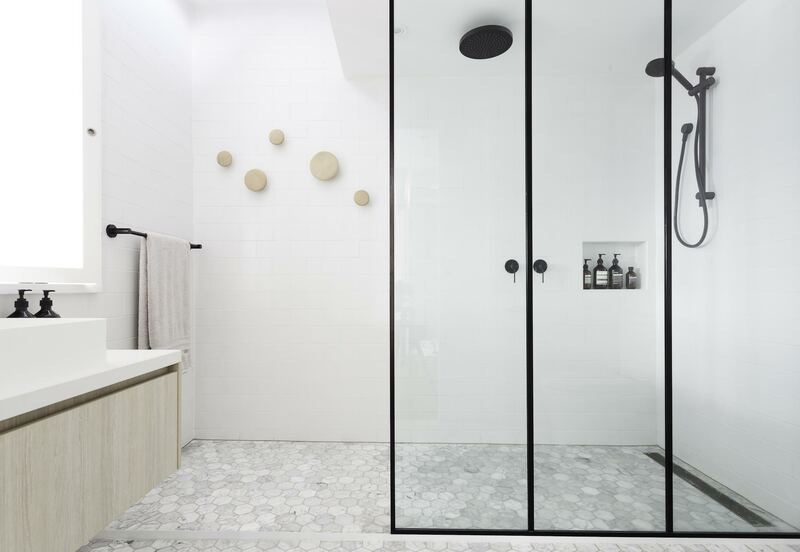 We were equally impressed by the designer’s mixed European aesthetic, as much as his broad repertoire of Melbourne based projects. Spinzi derives his design inspirations from European influences combined with other styles such as minimalism, Asian art, modern industrial and classical influences to create a balanced fusion. What first triggered your interest in architecture & design? I have always enjoyed designing and sketching and have always had an interest in architectural buildings and products, even throughout my childhood. I love the idea of being able to transform spaces and objects with my own vision. How long have you been a professional designer? I previously worked in an Architectural firm as an Interior designer for 6 years in Switzerland. I then re-located to Australia and have worked as a interior designer for 5 years here. What is your experience to date? I started in Italy, then Switzerland, as well as having some experience in New York and here in Australia as well. I created my own Interior Design business 2 years ago. I worked in architecture firms initially and then branched out into Interior Design. In Europe, the same firm often handles both architecture and interior design, so I had experience in both areas. I have worked on projects for new construction, renovation or restoration of historical buildings, churches and villas in Europe. All have provided me with important knowledge and expertise that is invaluable for me today. Would you say you have a signature style or design philosophy? Projects differ and are dependent on many factors, however, wherever I can use my personal style, I like to create a modern, eclectic designs. I would say most of my designs are minimal / contemporary with a slight mixing in of old key pieces that are unexpected and interesting. I also like to implement influences of different cultures. Another way I add my own unique touch is by using sculptural pieces and focus on using artwork in my interiors. Are there particular elements you like to implement into all of your designs? Sculptural pieces, antiques, Italian furniture, custom-made furniture, art inspiration, architectural elements, fusions of different cultures and styles, different finishes and materials. 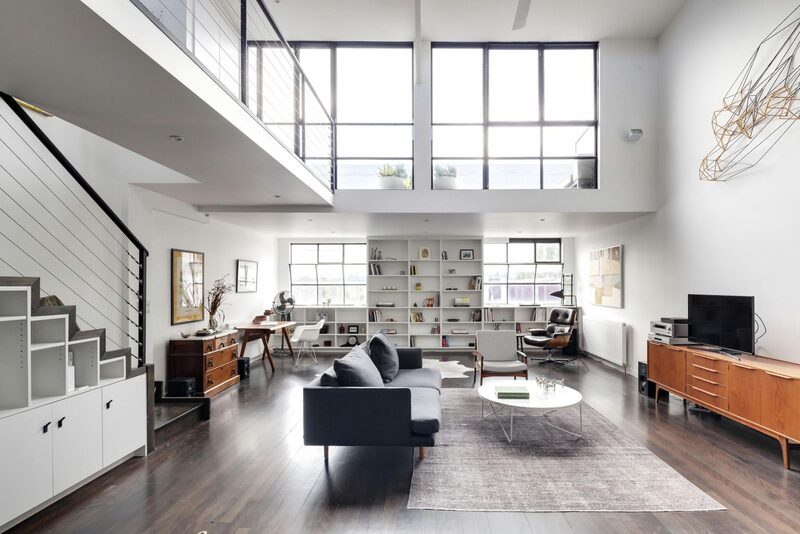 Watch this space for our next blog – we will be featuring one of Spinzi Design’s amazing projects; a 150 year old warehouse is transformed into a modern, tri-level home in Richmond, Victoria. 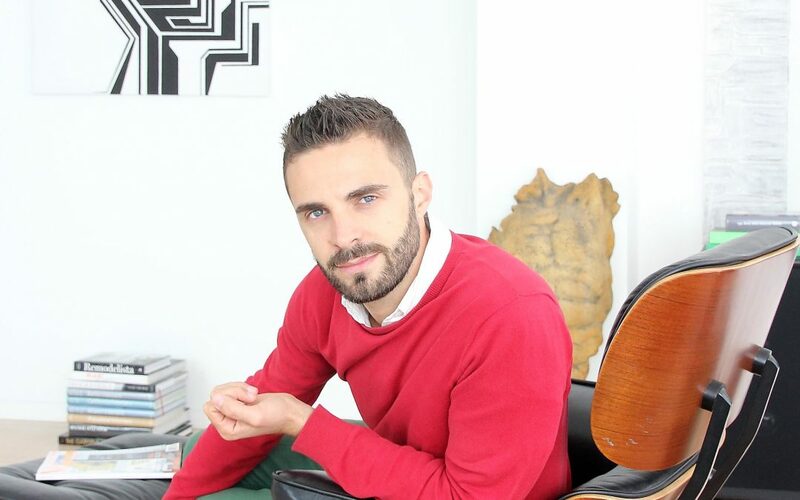 We would like to thank Tommaso for his time and are very excited to see more of his fabulous designs. Spinzi Design is definitely one to watch. 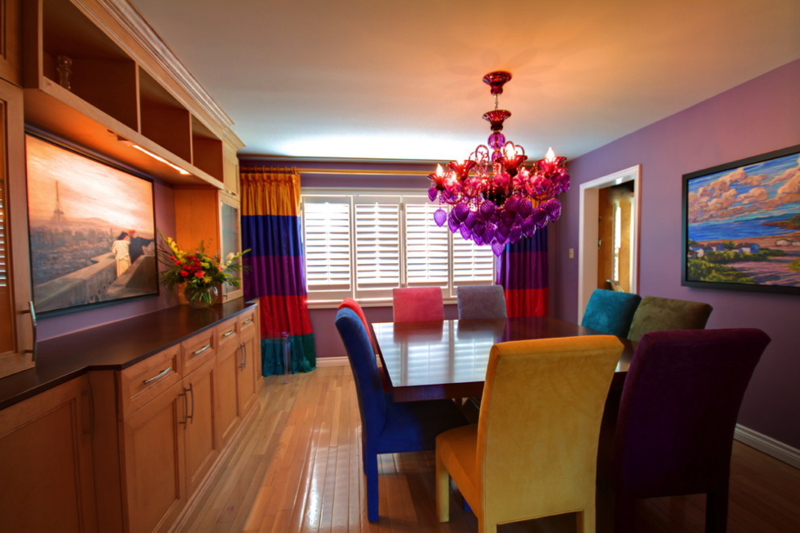 Bold colours are often a great way to express a home’s personality and interests. The following 10 designs prove that bold is beautiful. 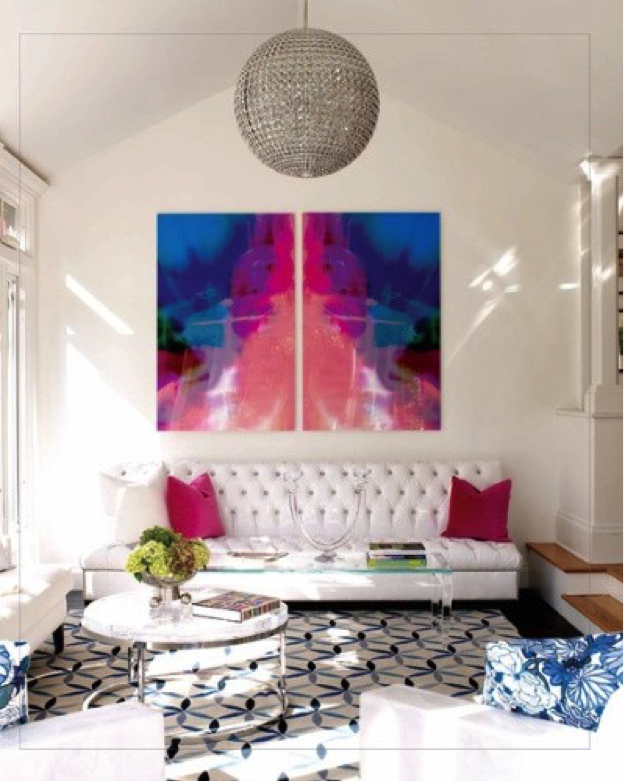 See how the spectrum of colours transforms ordinary rooms into extraordinary works of art. Typically when designing, you limit yourself to two to three colours to decorate with. 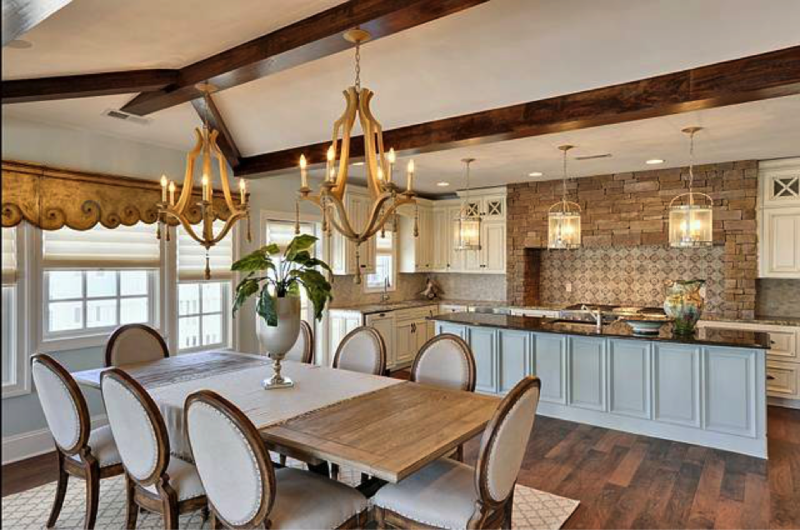 In the case of this dining area, however, the sky is the limit. The simplicity of the furnishings allows the rainbow of colors to shine. This no-frills eating spot is all about color and nothing more. 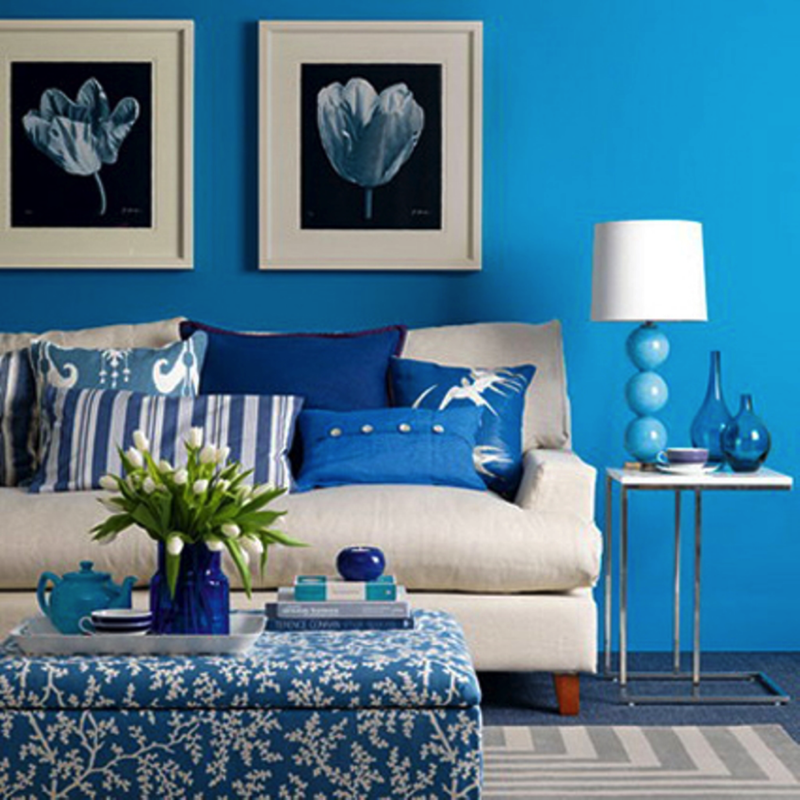 Mixing and matching different shades of blues creates depth. Don’t be afraid to experiment using lighter and darker versions of your main color. Here, you see how light blues and dark blues work together in the same areas of the room. Although it might not be everyone’s thing, purple is the colour of wealth and royalty. Since it is a bold color, use fun prints to break up the monotony. Where else can you use cheetah print without it looking tacky? 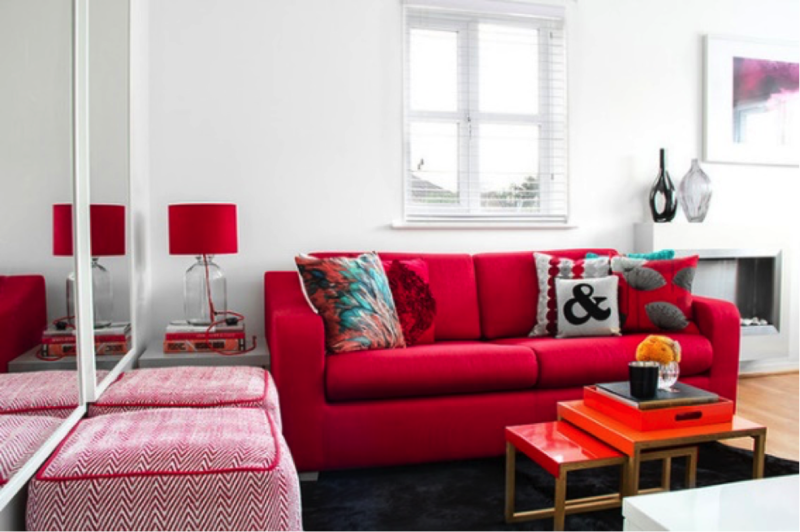 What’s not to love about a bold pink couch? 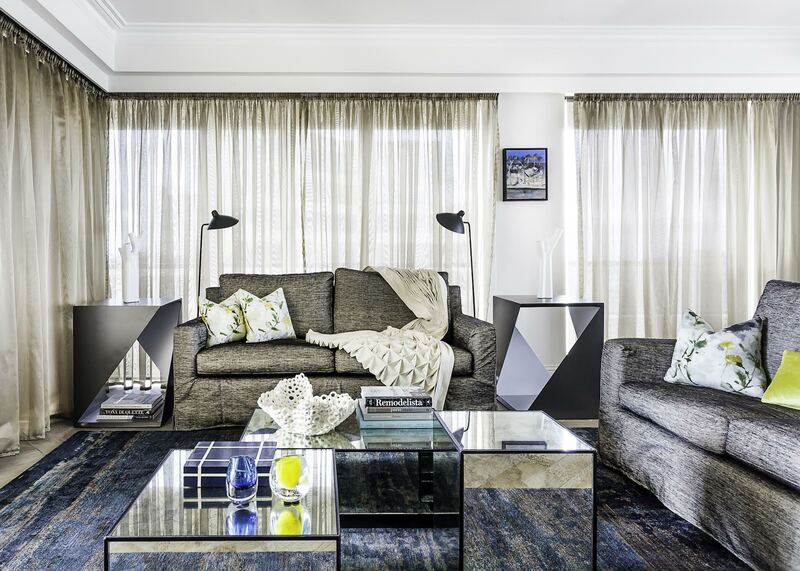 This space takes advantage of colour by dispersing splashes of it throughout the room. 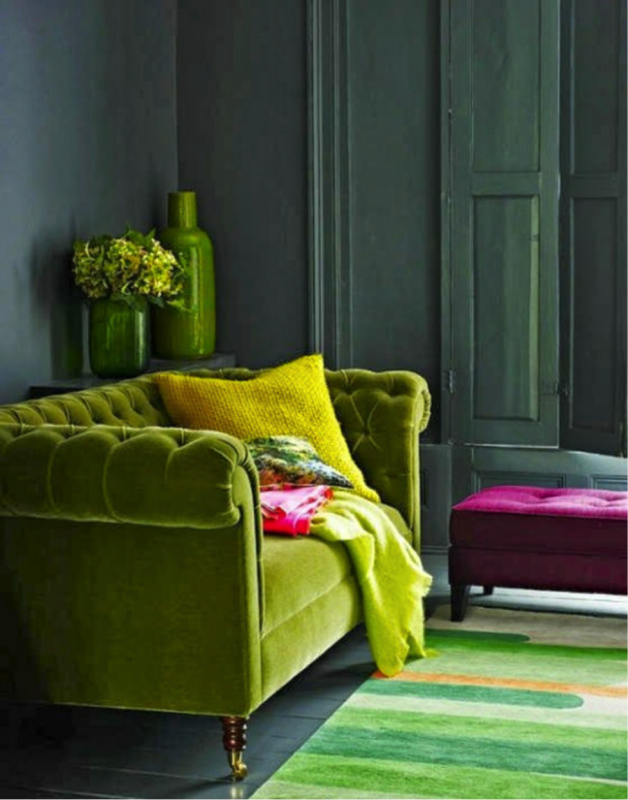 The black rug ties all the colours together making them cohesive and beautiful. The whole room doesn’t have to be colourful. 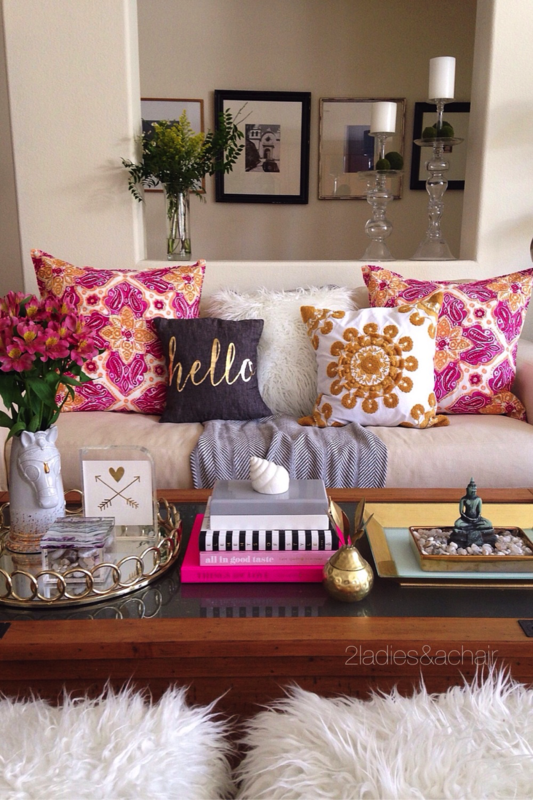 A few pops of bright pink is enough to break up a neutral color scheme. It stands out in a room that would otherwise go unnoticed like this one. 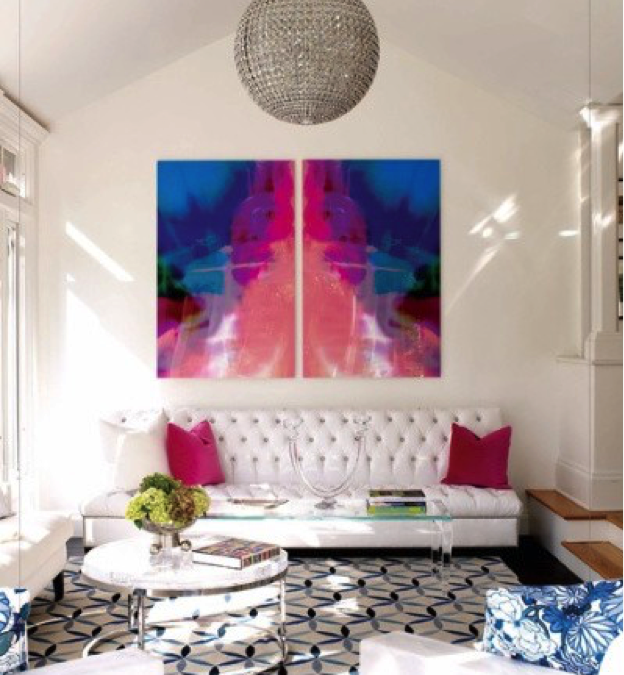 Bright and beautiful, this oversized painting serves as the focal point of the room and allowed the designer to playfully incorporate colour and pattern into the space. Although you wouldn’t think a Moroccan motif rug would match a floral print pillow, the colors in the painting make the pairing work like magic. Floral curtains aren’t passé. 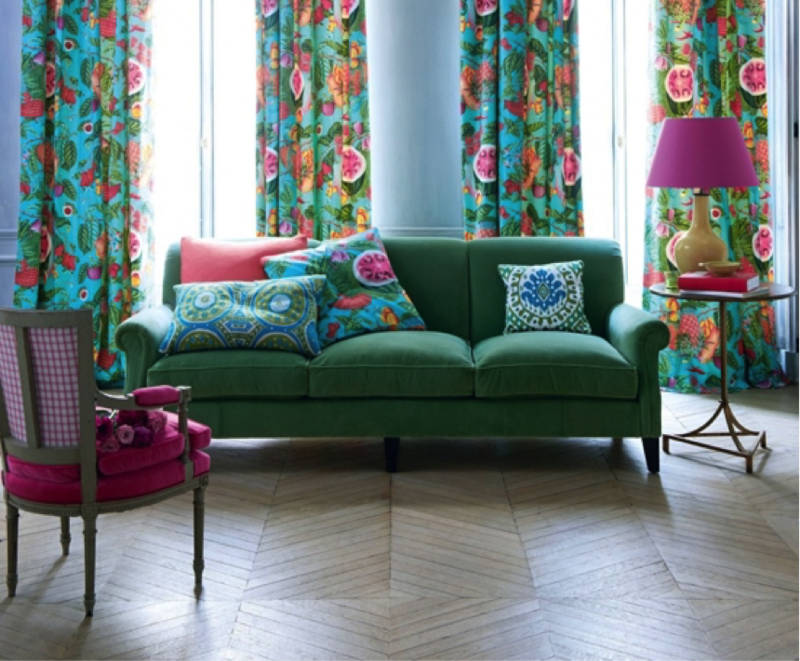 In fact, a bold design like this provides plenty of colour options to decorate with. This room makes the most of the greens, pinks, blues, and purples in the curtains. If you want to decorate from the ground up, look how masterful this designer was at pulling everything together. The only thing that isn’t wildly coloured are the plates, stemware, and flatware. Everything else commands your attention by being bright and energizing, the way you hope the meal being served is. Pink and black isn’t reserved for little girls. It’s also the number one choice of big girls, too. 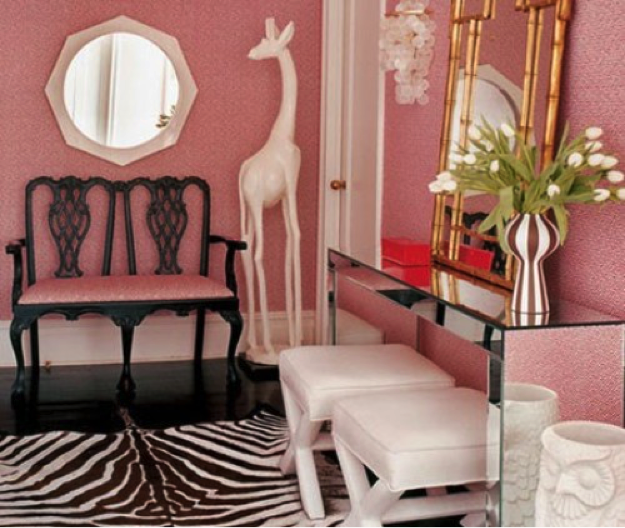 See how the safari theme helps balance the pink walls and bench by adding pattern and texture? 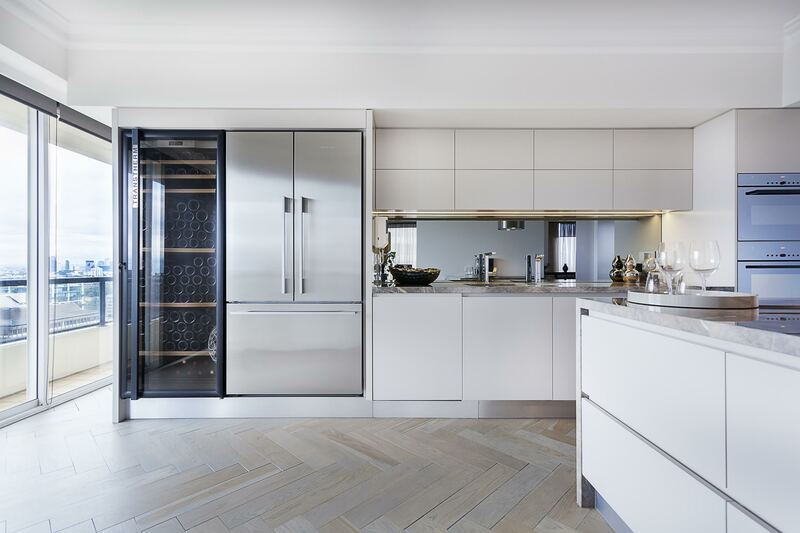 You can only imagine how inspiration flows in a kitchen like this. Why settle on one color when you can section off different areas of the room and use them all? 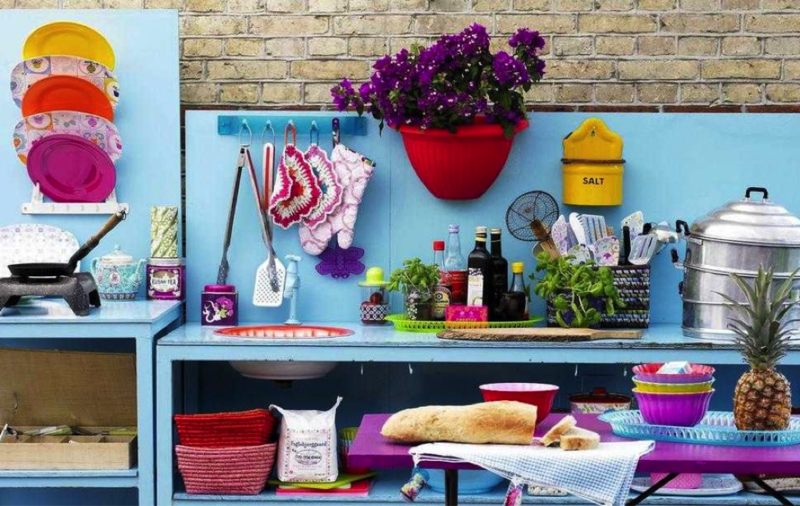 The sun streaming through the window has nothing on this bright coloured kitchen. 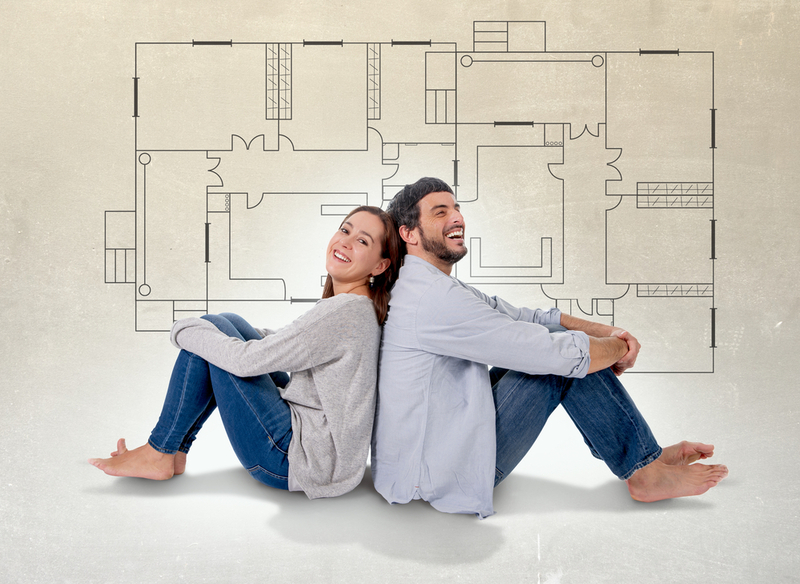 A floor plan is one of the most important tools of the trade! 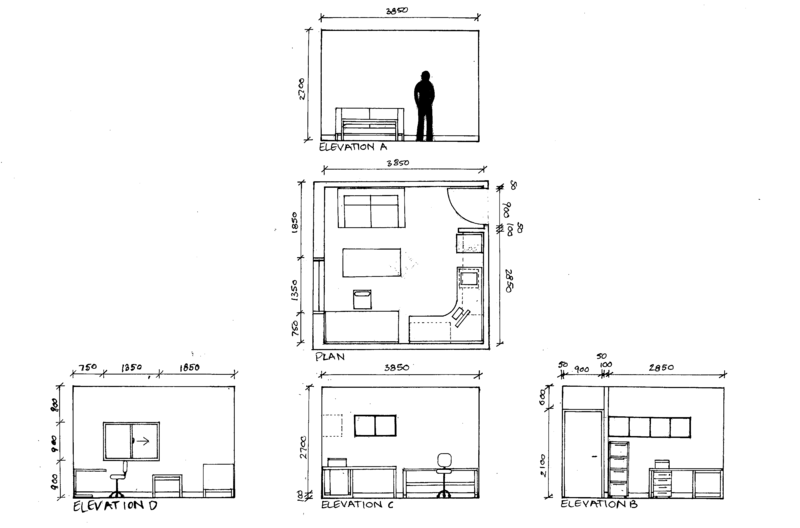 Knowing how to produce a floor plan, helps you to accurately design and furnish a space. Without one, it’s very tricky to identify what the best placement of furniture will be and which size will fit best within the room. Sure you can make a guess-timate but nothing beats accuracy when purchasing big ticket items such as sofas, chairs and dining tables etc. It can become a costly mistake if the items you loved so much in the store don’t fit the proportions of the room as best they could or worse still, can’t even go through the door way or up the stairs! Measuring the space before making any purchases is the best way to ensure a successful outcome and a home that looks amazing! 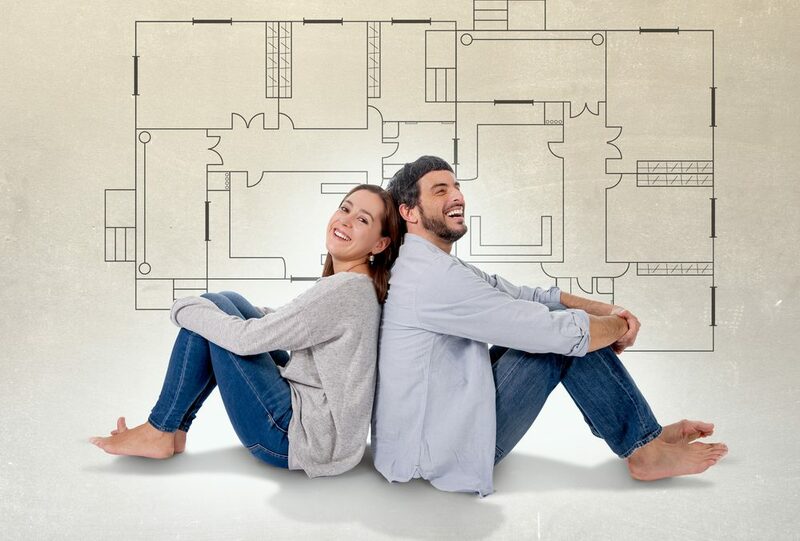 View our easy to follow step-by-step guide below to learn how to draft your own floor plan and master the art of space planning. 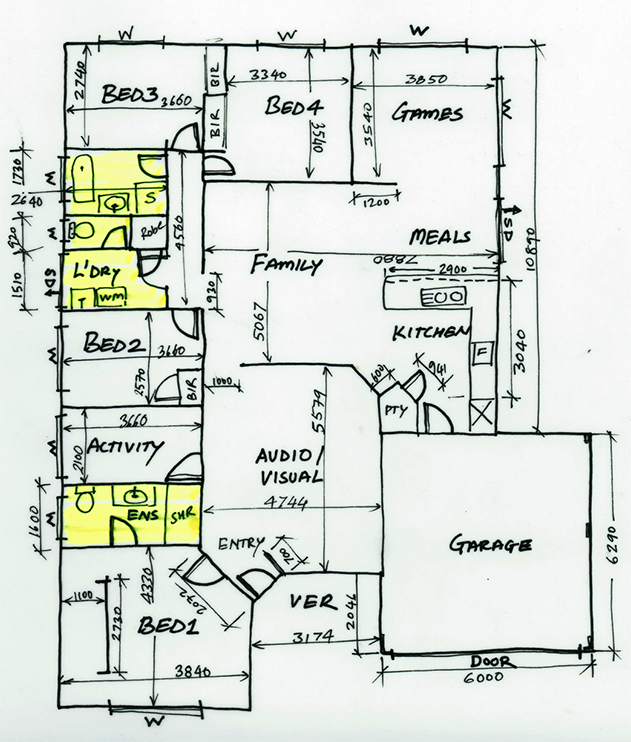 So what does a floor plan show? A floor plan is a drawing showing a view from above that’s drawn to scale. The information recorded shows the relationships between rooms and other elements within the space such a built-in cabinetry, columns and furniture. Dimensions are recorded to specify room sizes, lengths and height etc. They are the measured distance between two points e.g. from one wall to another wall or from the wall to a door opening etc. • 3 different coloured pens, e.g Red, Blue, Black (for first timers start with a pencil first until you the hang of it in case you need to erase). Step 2. What to do next. 1. Walk around the room (or rooms) to familiarise yourself with the space. 2. 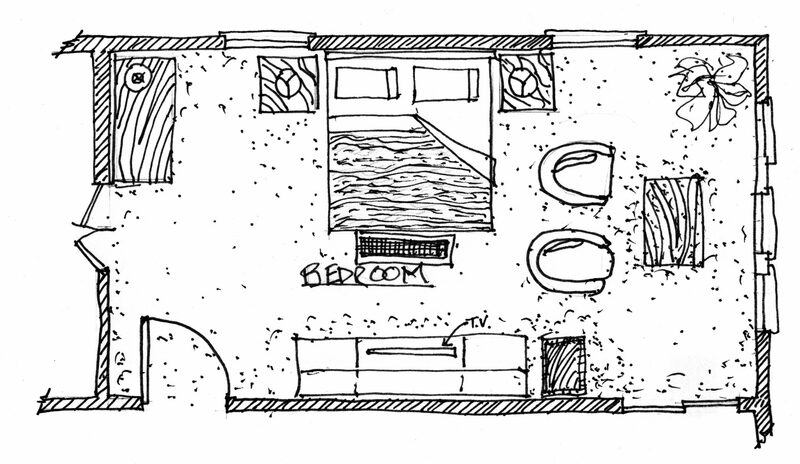 Using the clipboard to lean on, take your black pen and paper and commence sketching the outline of the room. 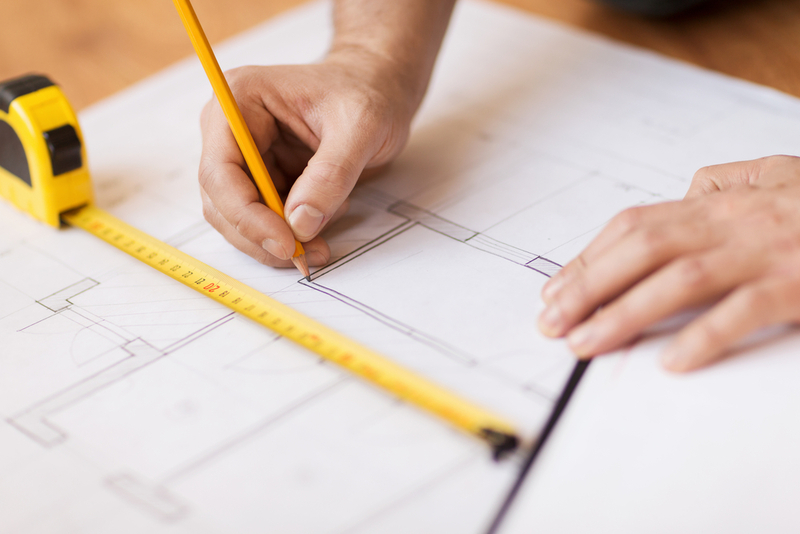 Be sure to leave enough white space around the outside of your sheet of paper to record the dimensions (measurements). – Positions of any fixtures i.e. fireplaces, kitchen benches, WC’s. – Relationships between rooms, and label each. Step 3. Take your measuring tape and start measuring then record the room dimensions. – Any other fixed elements within room such a cabinetry, structural columns, fire-places, radiators etc. Always measure in millimetres, generally a 1:100 or 1:50 scale is used for a room. Measure the longest wall first. If your measuring tape can’t reach the length of the room, place a marker such as a pen or piece of masking tape to mark where the tape measure ends and then continue to measure from that point to the end of the room. Record the overall dimension as well as the individual dimensions. It’s quite easy to record something incorrectly by mistake, if you have an overall dimension you can work backwards to figure out what it should be. It’s always easier and faster to have someone assist in holding the tape measure. One can read out the dimension while the other notates it on the plan. If measuring by yourself, place the measuring tape on the floor, it is more stable that way. Step 4. Record Lighting and Electrical Information. Once you have recorded all of the information for your plan view – it’s time to elevate up and not the heights of things. – Grab a fresh sheet of paper and black pen (or pencil for first-timers). – Stand facing the wall you want to measure. – Draw the image that you see onto the paper (this is an elevation). – Record the position of the windows and doors etc. Step 6. Take photographs or a video of the rooms to refer to later. It’s always good to have a memory prompt. Step 7. Draw your Floor Plan to Scale! 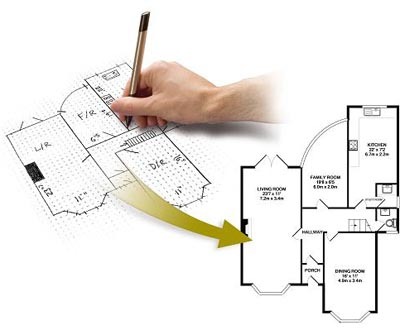 Not that you have gathered all of the information needed, draw the space to scale using a scale ruler and graph paper, as mentioned previously if drawing up your whole house plan, stick to a scale of 1:100 or 1:50 for a room and 1:20 for an elevation. TIP: Note the longest dimensions of the floor plan first and work inwards from there to record walls with door and window openings. Make sure you leave enough space to record all of the dimensions. So once you have your floor plans draw to scale you will be able to see how to place furniture and what sizes will work best. If you have already furniture in mind, draw the items to scale on graph paper too. Then cut them out and overlay them on the plan. This will allow you move the pieces around freely and re-position them to see if they will fit in the location you desire. Once you have completed these steps you will have all the information you need to create a comfortable functional home that looks superb and can be enjoyed for years to come! Happy planning! 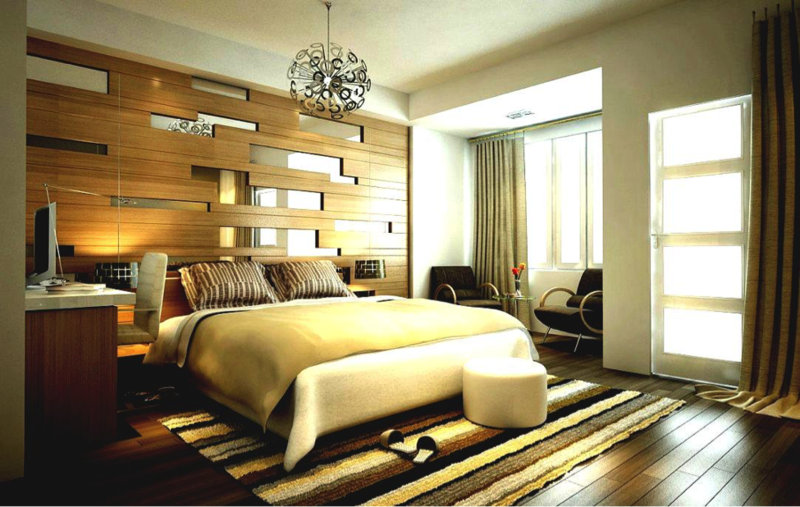 When it comes to interior design, color is nice but neutrals done beautifully is even better. 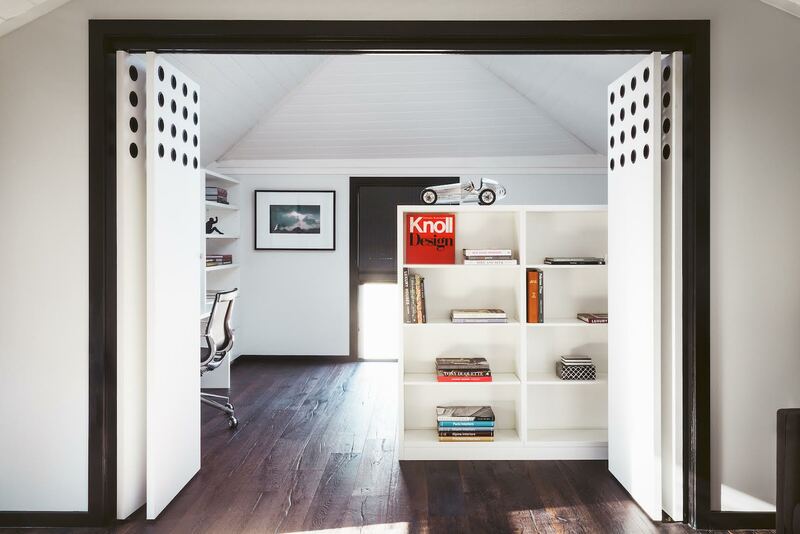 Here are eight rooms done masterfully. 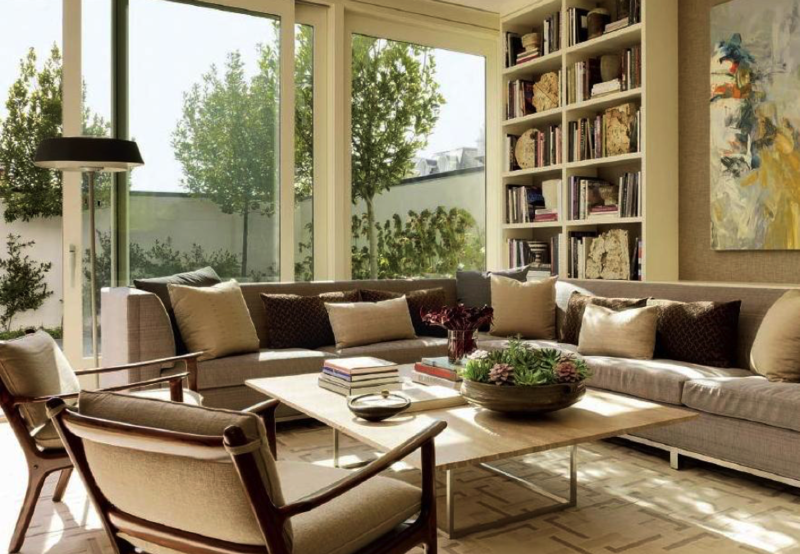 Note how neutral colors look amazing in every area of the home. 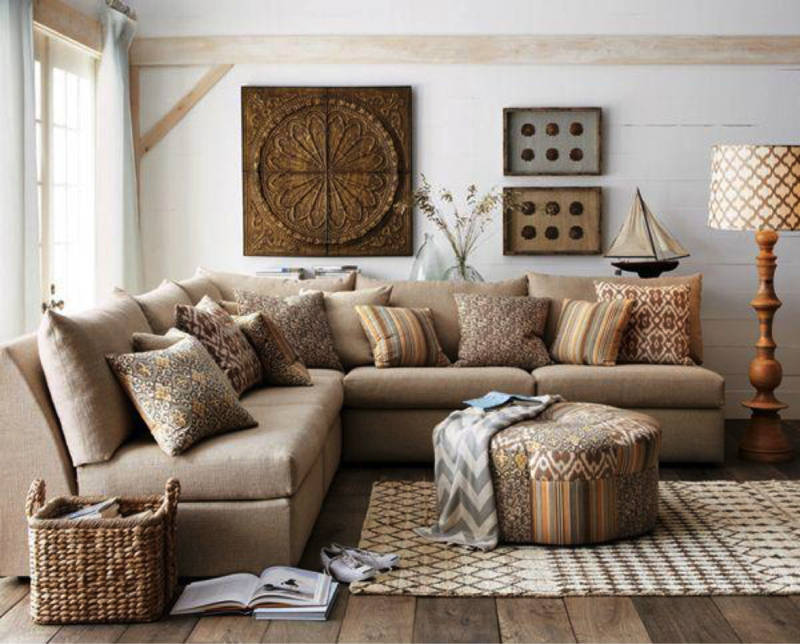 Keep things flowing nicely by choosing fabric that takes on the same colors and texture of wood. This spare bedroom incorporates linen sheets, pillows, and window coverings that match the light color of the wood closet, chair, and bed. A wicker headboard and linen window covering make the perfect combination. It has an organic quality to it which is naturally beautiful and light. 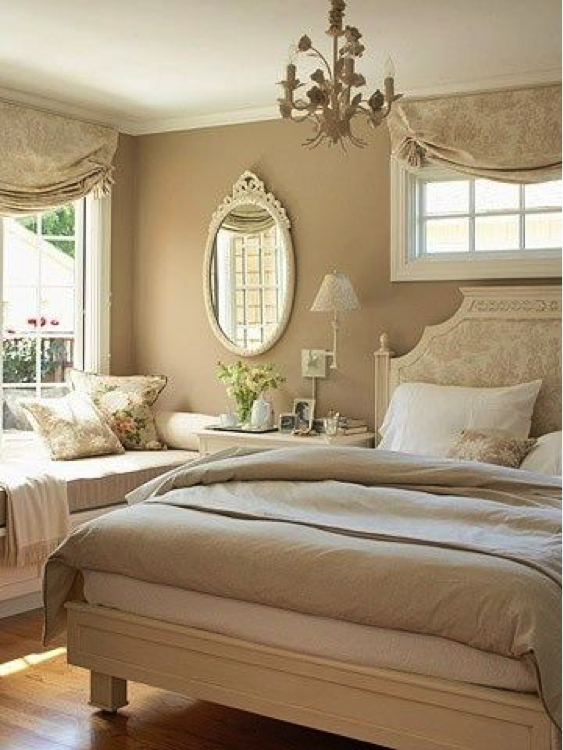 Paired with a neutral colored bedspread, this bedroom is aesthetically pleasing and airy. Everything about this room is comforting. From the neutral colored walls to the tiniest details including the color of the picture frames on the bedside table, this space welcomes natural light and serves as a cool reminder that you don’t have to be a minimalist if you use a variety of sized items to decorate a room. Although the look of beige and linen seems to dominate this list, here’s a refreshing reminder of how warm earth tones are. See how the dark brown in the rug matches the wood grain of the desk? The darker color of the chairs helps balance out the light beige of the footstool and the comforter. The contrast of patterns is what makes this living room pop. It’s one of the easiest ways to keep neutral colored spaces vibrant and interesting. 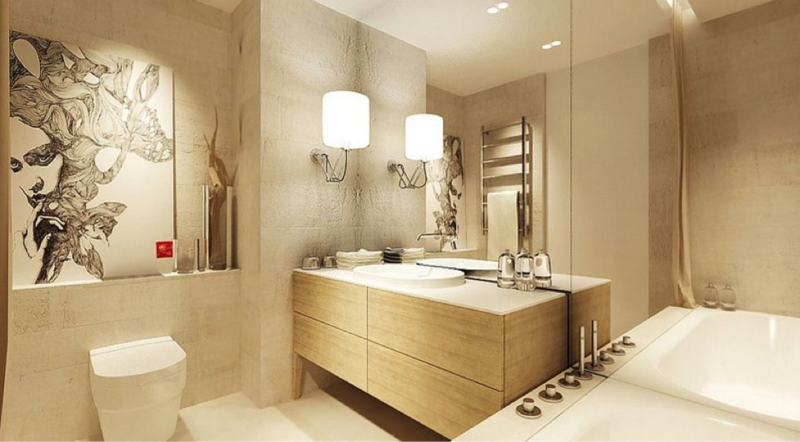 Clean and well-lit, this modern bathroom is hard to recognize because there’s nothing traditional about it. Even the sink and toilet blend into the background so well that they’re hardly noticeable. This earthy kitchen makes use of wood and stone throughout its space. Decorating with neutrals makes sense because they match the natural color of the floor and backsplash. Alternating taller items with shorter items is a great way to achieve balance. See how sculptures and vases are used on each shelf of the bookcase to make it look harmonious? Receive the latest deals. Join and get $30 Off.